Swiss automaker Hublot has released a new Classic Fusion Ferrari GT watch, which was designed by Flavio Manzoni, head of design at Ferrari, and his team. Hublot and Ferrari have collaborated on projects since 2011. 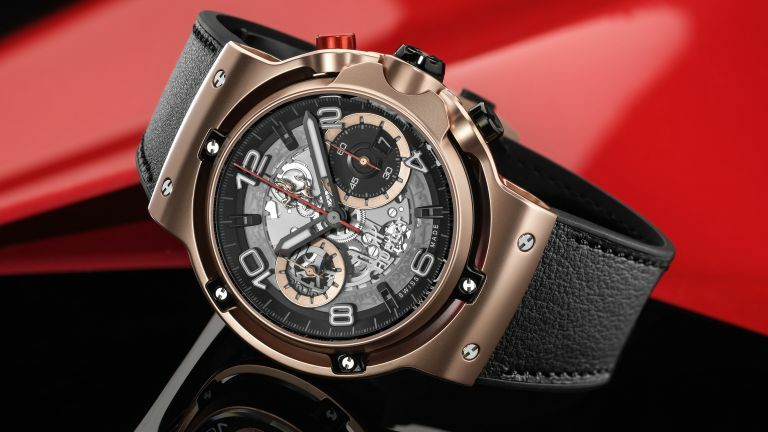 Previously, the two companies teamed up on the Big Bang Ferrari, the La Ferrari timepiece with 50 days of power reserve, and the Tech Frame Tourbillon Chronograph. The new watch features new UNICO manufacture movement and pays tribute to the “Grand Touring” cars. The watch features self-winding flyback chronograph movement, a 4 Hz frequency (28,800 mph) and a column wheel that can be viewed on the dial side. It comes in three different finishes—Titanium (limited to 1,000 pieces) for US$22,000, King Gold (limited to 500 pieces) for US$38,000 and 3D Carbon (limited edition to 500 pieces) for $27,300. 3D carbon is new to fine watchmaking; it is lightweight yet solidly constructed. The watch takes inspiration from the GT designed and built in the Maranello workshops. Hublot developed the motor, while Ferarri worked on the body of the watch. “The Classic Fusion Ferrari GT is a watch for lovers of fine mechanical pieces who want to display a contemporary and refined style,” according to Hublot. The dial is transparent and made of sapphire crystal. It features Ferrari’s famous Prancing Horse at 12 o’clock. There is a red thread around the sapphire crystal with anti-reflective coating, paying homage to the automaker’s famous colour. The watch’s straps are made of black rubber and are covered in Schedoni leather just like the seats in the Maranello historical race cars. It has a thickness of only 13.15 mm.